Vanilla slice seems to be one of those bakery goods that’s always bought and never made. It has long been one of my favourite desserts. Whenever I walk into a patisserie it is one thing I always order. You’ll be surprised how easy it is to make, though… and how utterly delicious it is when you do. 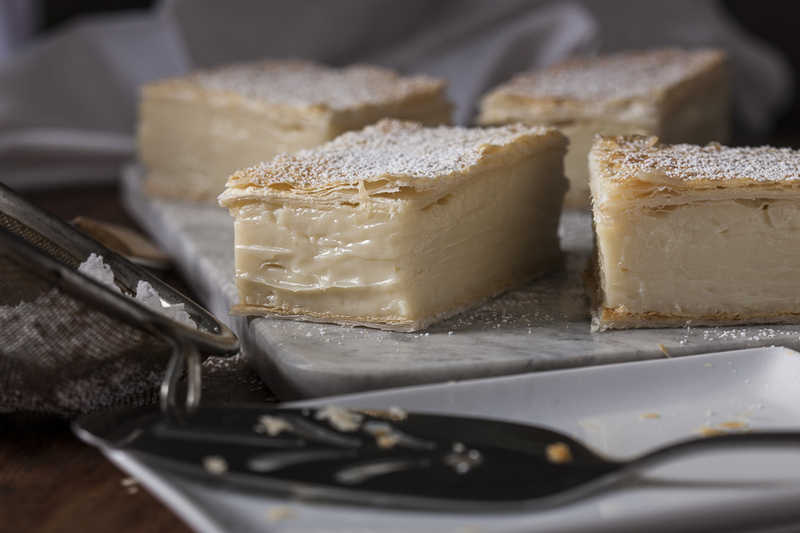 Vanilla slice has a few different names; mille-feuille, custard slice, and also the Napoleon. Give this one a try! Preheat the oven to 180C. Trim both sheets of puff pastry to fit a rectangular slice tin, measuring 20 centimetres by 30 centimetres. Next, line a baking tray with non-stick paper. Place the two trimmed pastry sheets on the baking tray side by side, with a small gap between to allow room for spreading. Top with another layer of baking paper and place a tray on top of the baking paper to weigh the pastry down while cooking (to limit rising and bubbling). Bake for 15 to 20 minutes, checking for colour. They should be light golden. Cool on wire racks. Remove from the heat and cool to room temperature. Line the tin with non-stick baking paper, greasing lightly to hold the paper in place, with the paper hanging over the sides (the baking paper provides a handle to lift out the slice once set). Place one of the cooked pastry sheets into the base of the lined tin. It should fit snug to the edges. Spread the cooled custard over the pastry. Top with the remaining pastry sheet. Fold the overhanging baking paper back over the top to enclose. Cover with plastic wrap. Refrigerate for at least two hours until set. To remove, carefully lift the overhanging baking paper and place on a board, ready to slice. Peel away the paper and dust with icing sugar. To successfully slice this without squashing the custard from the middle, use a small, sharp knife and cut through only the top layer of pastry, marking out 10 even-sized slices. Then go back and slice the rest of the way down through the initial cut in the pastry, with a large, sharp knife until you hit the bottom layer of pastry, pushing down to cut.